Trying to keep a restaurant going for more than a decade in KL is a little like trying to weave a motorcycle through the traffic on Jalan Tun Razak: With patience and a good driver, you’ll manage to avoid cars jumping lanes, trucks going too fast, bikes slipping in and out of stopped cars and eventually stay the course and get to where you need to go. Setting the standard for Italian cuisine in Kuala Lumpur since 2004, Prego at The Westin Kuala Lumpur is pleased to have a new driver behind its wheel: Chef Ricky Parlanti. 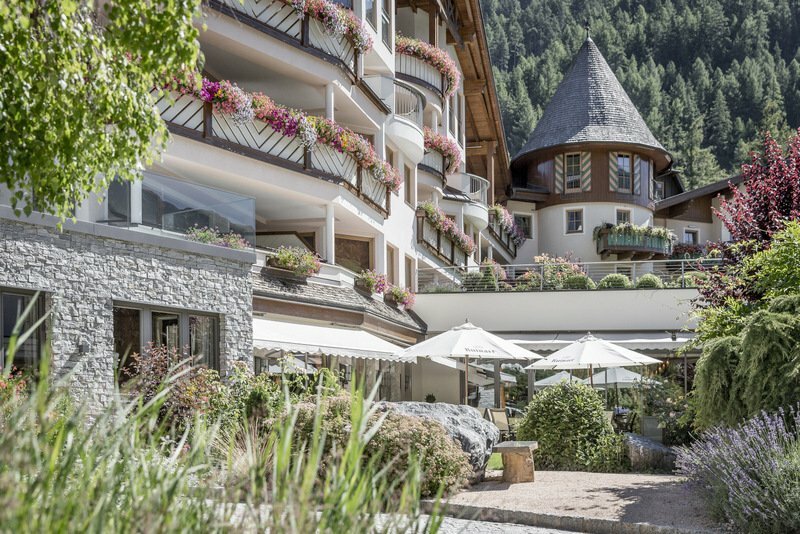 Chef Ricky has recently joined the team as Italian Chef de Cuisine after sharing his love of food and cooking in such far-flung places as China, India, and Australia. We were pleased to have the chance to learn about his driving style over lunch this month. Crusty wholemeal bread greeted us at the table along with a trio of tapenade, balsamic and olive oil, and roasted tomato oil for dipping. It wasn’t long before fresh focaccia was added to the bread bonanza. Salty and herby, the texture was the perfect mix of pillow soft and crisp edges, still warm from the oven. Setting our GPS for classic favorites from the menu, we began our trip with the artistic landscape of Burrata Cheese with Grilled Spring Vegetables (RM65). 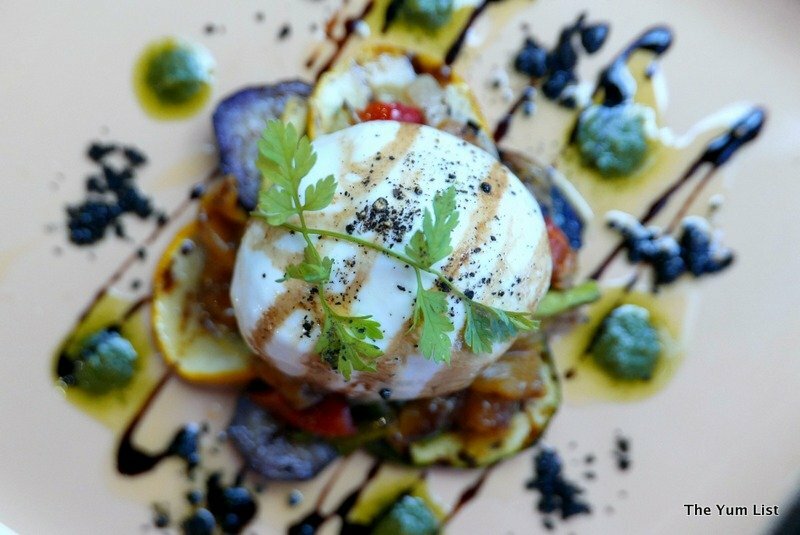 A bulb of fresh Burrata is lightly torched to liquefy the center and then planted on a bed of grilled onions, red peppers, eggplant, and squash. Creaminess leaks onto the plate from the first cut and wraps itself around the veggies like a present. With a twist of black pepper and drizzles of balsamic and basil-pine nut emulsion, I was simply driven to distraction. Lunch flavors (and dinner, for that matter) are always enhanced by a little wine. 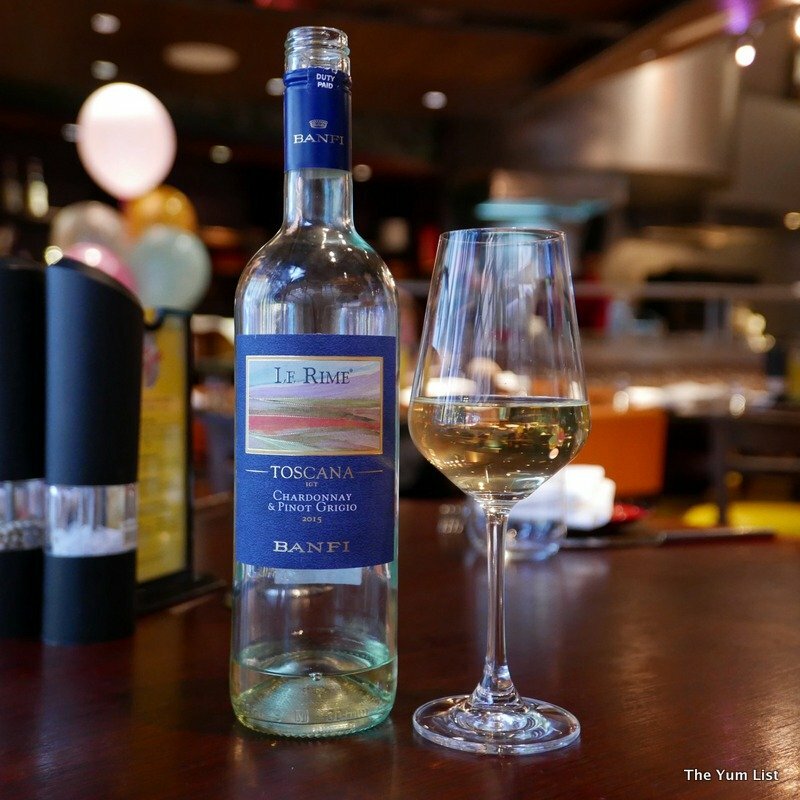 Our hosts recommended the house white, a 2015 Chardonnay and Pinot Grigio blend from Tuscany, fruity with a crisp finish that complemented the cheese nicely. At the next bend in the road, we encountered the Truffle-Scented Cream of Field Mushroom Soup (RM42). Earthy aromas promised concentrated flavors, but my favorite part of this course was the texture: Creamy and blended, but not a puree. 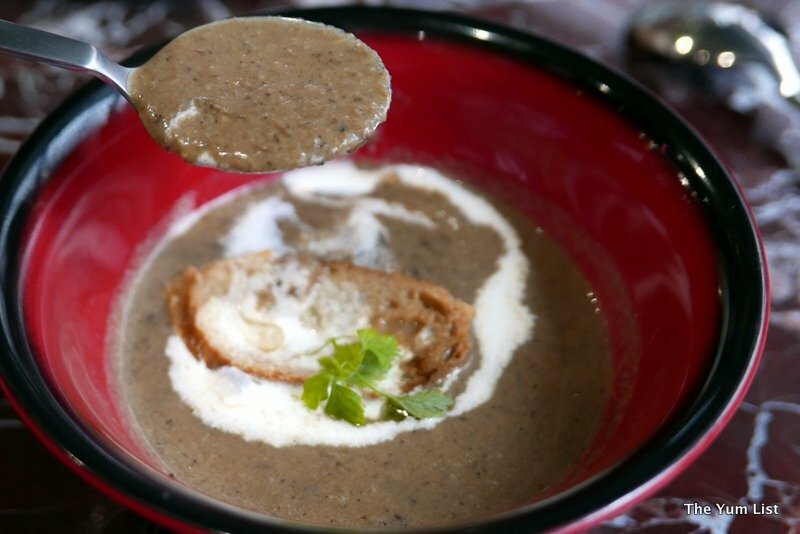 The soup held enough meatiness to remind consumers that mostly mushrooms went into its creation, with just a little broth and cream to hold it together. 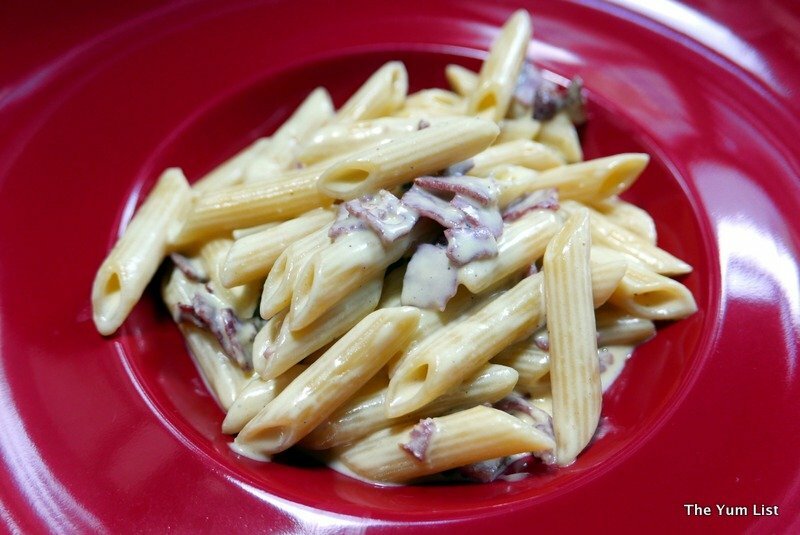 For the pasta course, Chef Ricky selected the Carbonara E Castelmagno (RM68), Prego’s special carbonara with penne. THIS IS A DISH TO ROAD TRIP ACROSS THE COUNTRY FOR! The carbonara itself is lovely, beef bacon dressed in egg yolk and cream for a finish that is not overly rich. HOWEVER, Prego takes that hotly dressed pasta and turns it into a cylinder of Castelmagno cheese for the finishing toss. Not grated Parmesan sprinkled over the top like you fix at home watching reruns of Pimp My Ride, but hotly sauced pasta tossed in the cheese wheel itself to bring all that melty goodness right into the cream and egg. Prego brings the Castelmagno right from Italy, a cow’s milk cheese with the zest of a young gorgonzola. Note for special diets: All the pasta and pizzas at Prego can be made with wholemeal flour or gluten/egg free flour. The personable Chef Ricky hopes to bring more of a true Trattoria spirit with what he calls a Menu Sorpresa. 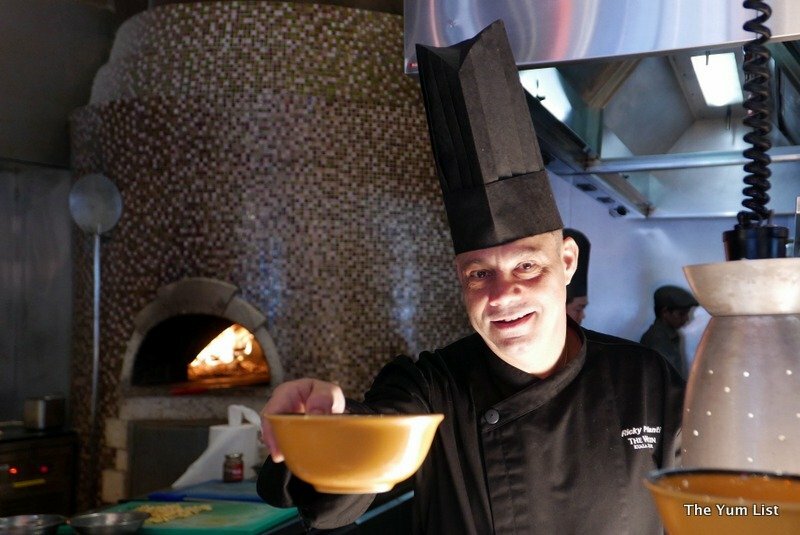 If you’re feeling adventurous one night at Prego, ask what the chef can make off the menu. 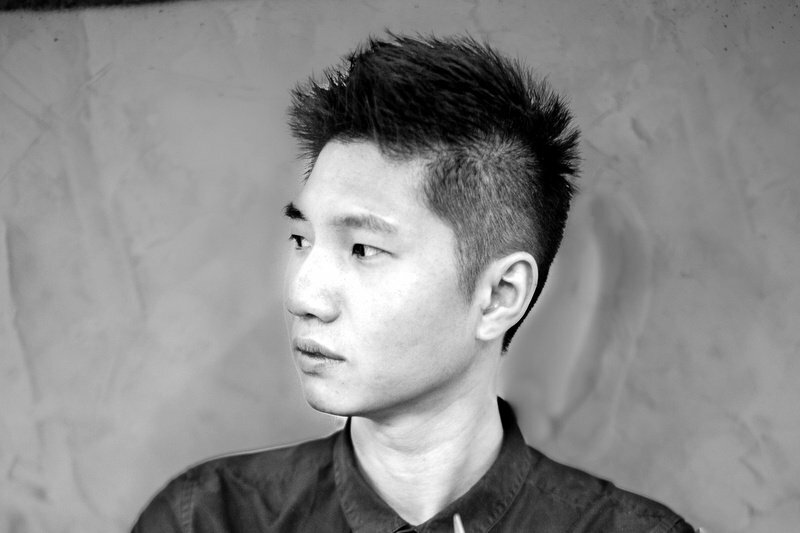 He will create something new, based on available ingredients, subject to the volume of orders coming into the kitchen. Our second main fell into this spirit of the Menu Sorpresa. Using the menu ingredients of Australian wagyu tenderloin and salted sea bass, Chef Ricky created a surf and turf plate with sauces and presentation of his own. 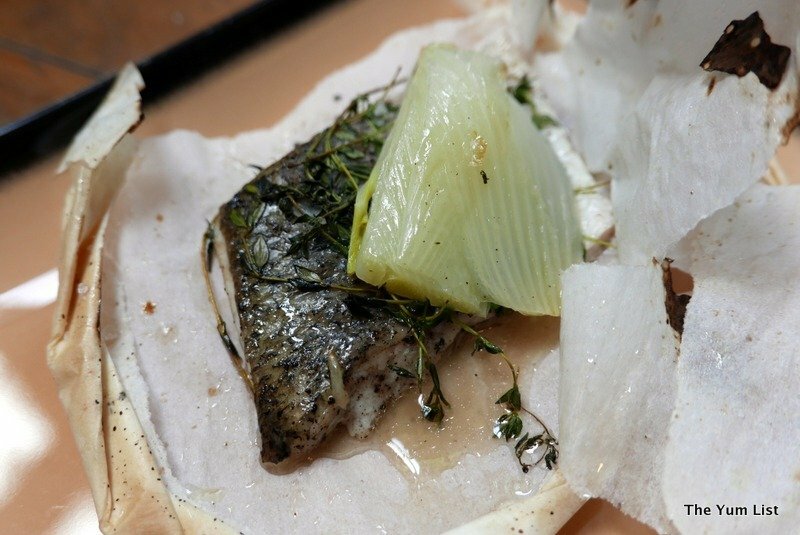 The sea bass arrived wrapped in parchment after having been baked with fresh herbs in a wood-fired oven. Tender and moist, it was served with lemon dill cream sauce. 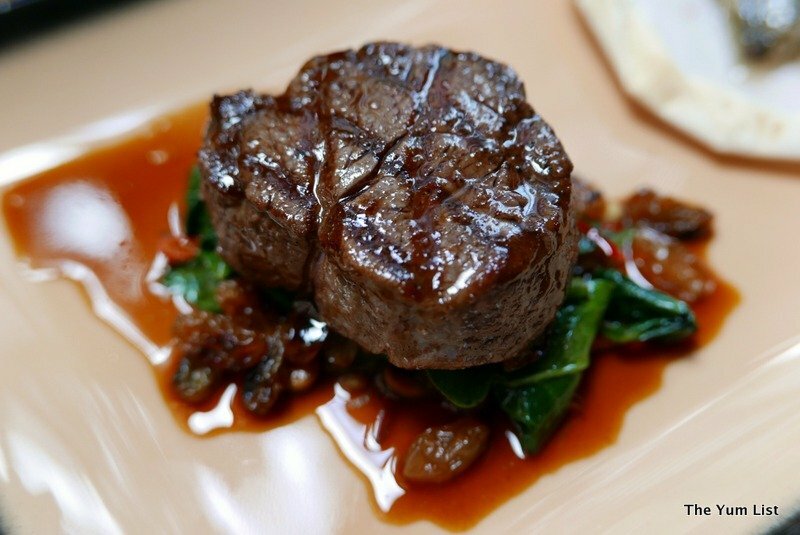 Its partner, the grilled beef, lay atop a bed of sauteed spinach, golden raisins and pine nuts in perfect medium rare. Apple jus finished the plate. Taking our engine into overdrive, we sped into Il Dolce with Tiramisu Tradizionale (RM30), my favorite dessert on the planet. 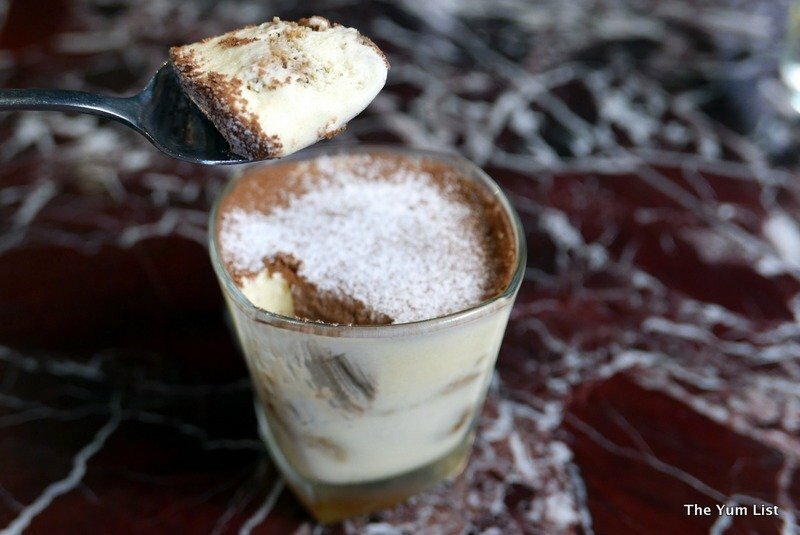 At Prego, mascarpone gets frothed into a cream and spread over espresso, ladyfingers and a little brandy. I told myself I would only have a bite for the tasting, but I could barely stop myself from licking the dish clean. 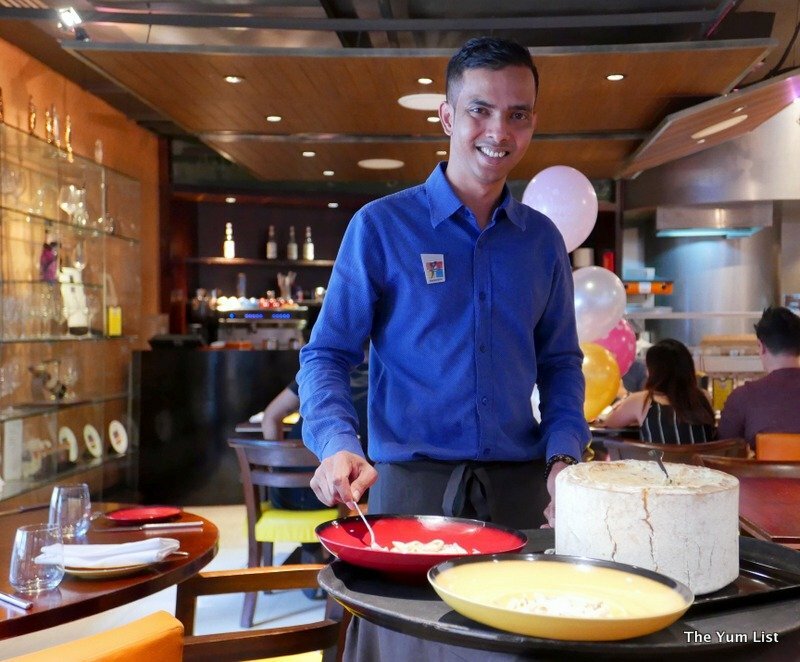 A lot of restaurants profess to authentic Italian cuisine, but Prego is the one that has cut through the traffic congestion again and again. Might be time to change lanes yourself and discover the new driver behind the wheel at Prego. Wow! That’s a great restaurant! Such different dishes to each taste and also drinks!!! Really unique! 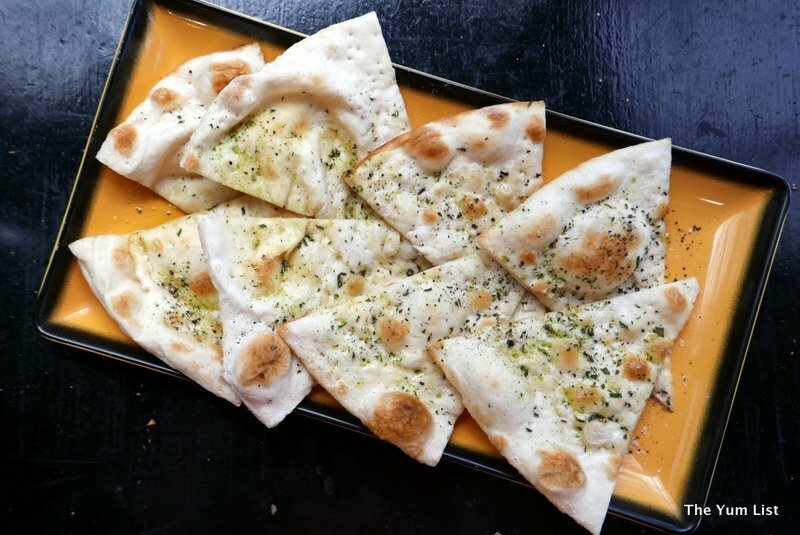 Pizza bread looks crusty and fragrant. Oooo…I’d love that soup! Must be so rich and creamy. Yum yummm!!! Everything looks fantastic! 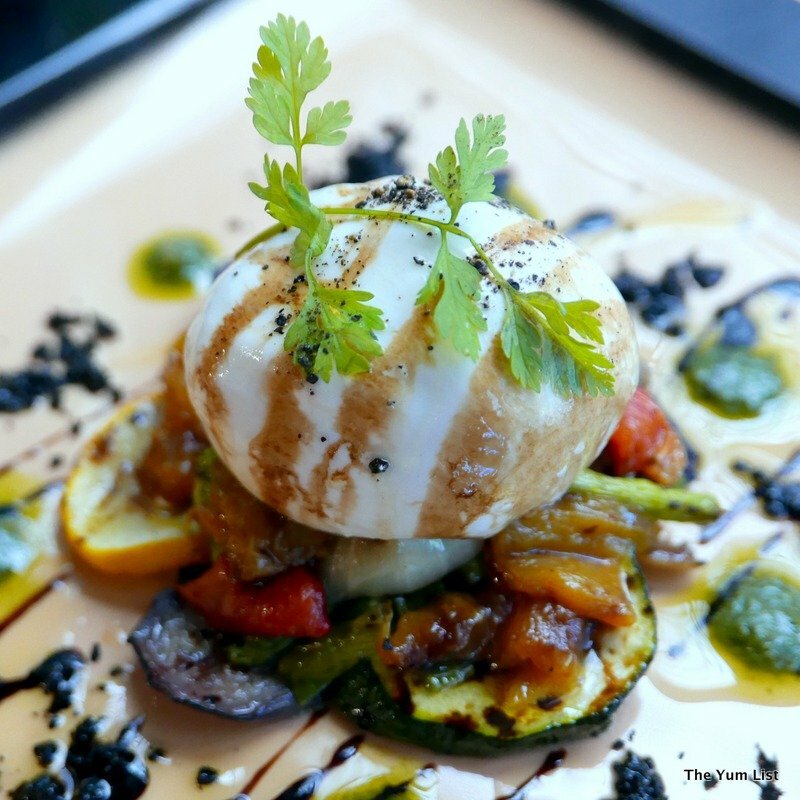 I would love to try that Burrata with grilled veggies! The pizza bread looks good and also the carbonara! Hello, everything looks delicious. Italian food is my favorite, the cheese and grilled veggies looks yummy. Thanks for sharing your review. Happy Friday, enjoy your day and weekend!